Writing food reviews on the blog is a little bit new for me, so apologies in advance if I don't really "get it right." I've done a few before, but only in the last couple of months has it really become part of South Molton St Style as I do eat out quite a bit in town... To be honest most of the time (if its any good) I just want to write "yummmmmmmm" repeatedly, occasionally with a few caps locks thrown in for good measure. Last Thursday my dinner very much lived up to that childish (and apparently inappropriate) way of writing. 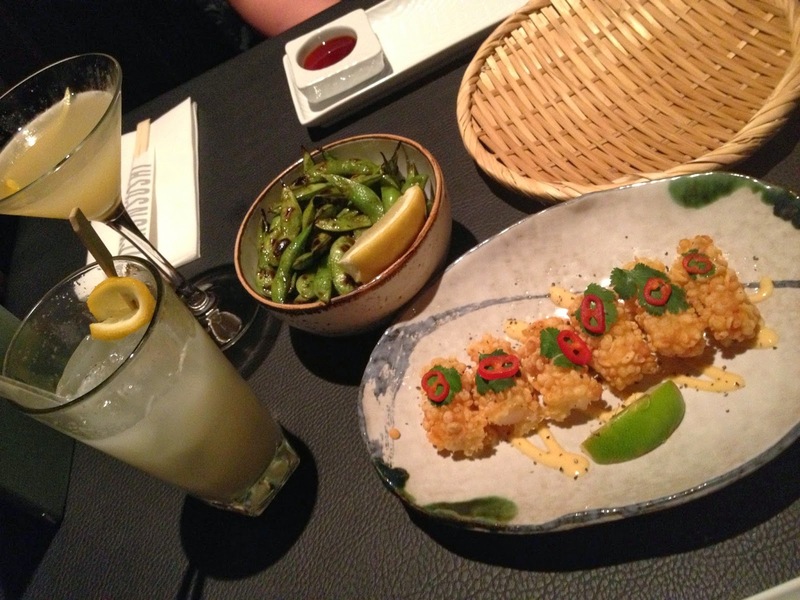 My friend Gemma and I went to Sticks N Sushi in Covent Garden, a stones throw from the hustle and bustle of the market. After devouring some chilli edamame beans and tempura breaded prawns, we were faced with the mammoth task of eating our way through the "sushi" part of our platter for two (as above). The fish was just so good it almost melted in your month. If I were being at all particular, I'd say the avocado was a little hard in a couple of the california rolls - but I'm not, so it was brilliant. When the "sticks" arrived we really didn't know how we were going to squeeze it in - but when meat tastes that good your body finds a way to cope... Maybe the cocktails helped too, as we were three down by this point. Considering the amount of food, ambience and service, you'd expect to pay a fortune in Covent Garden. The main course was £46 for the two of us and the cocktails are around £7 a pop - name me anywhere in the centre of town that can match the standard for that price and I'll eat my hat (though not my new H&M one as I'm a bit fond of it). Thank you so much to Cottrel and Klar for inviting us, we genuinely had a blast and have already recommended to friends... For anyone else, here is the site - book it right now! Great post - I don't think there's a way to mess up a food review tbh! Have wanted to go to Sticks n Sushi for ages, now even more convinced after seeing these photos.